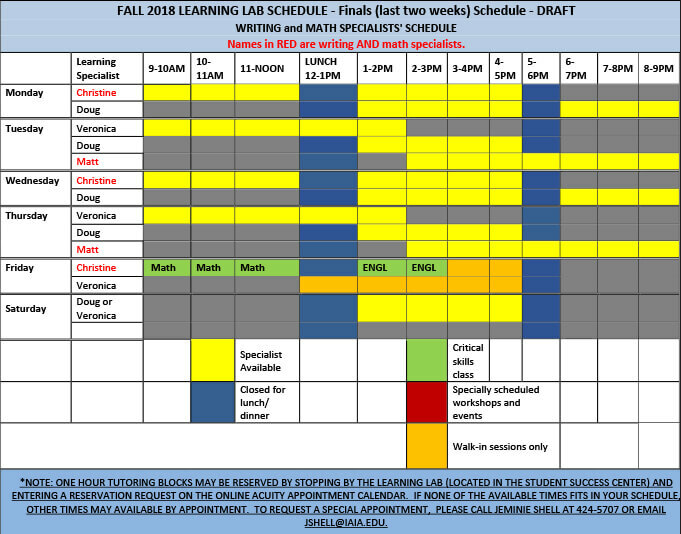 Many of the President’s and Dean’s list students are frequent visitors to the Learning Lab, especially those in their first or second year at IAIA who establish excellent study habits early on. They know that even the best students benefit from working one-on-one with a professional to ensure that they understand and complete their assignment successfully. The Learning Lab offers Learning Specialists (tutors) in Writing as well as Math, all of whom are degreed and experienced educators with backgrounds in teaching and/or tutoring. The Learning Specialists are familiar with the curriculum and assignments in Essential Studies English and Math courses; they can assist you with assignments in other IAIA courses as well. You can drop in at the Lab during open hours and meet with any Learning Specialist who is available. If all tutors are working with students, then sign up on the drop-in hours board for your own appointment. You could also request a “standing appointment,” a regularly scheduled time each week when you know you’ll need several sessions to work on a particular assignment. Sign up early, especially during busy times like midterms and finals, so you can be sure to reserve your time. Even if the Learning Specialists are working with other students, you’re welcome to come in for study time. The Lab offers comfortable lounge chairs for quiet reading and a couple of private areas for one-on-one work. Please refer to the Learning Specialist schedule for additional detail.